For the first time since two cyclists were killed this past summer after being struck by charter buses, bus companies sat down last week with the community, elected officials, the city’s Department of Transportation (DOT) and the NYPD. On a frigid March morning in downtown Albany, where church spires loom tall and traffic lights dangle from wires that stretch across intersections, a flurry of white-haired men in suits strolled down State Street. They were heading for Sixty State Street, the tony event space and banquet hall in the city’s Downtown Historic District, where a team of busboys were hurrying to arrange pastries on silver trays in anticipation of the guests’ arrival. Once they arrived, they mingled in groups, chatting over coffee and orange juice, shaking hands and exchanging business cards. They were surprisingly awake for 8 a.m., despite the reason for their gathering. This mostly male, mostly white, and mostly middle-aged crowd consisted mainly of the state politicians, lawyers, and entrepreneurs who were all of a sudden driving the state’s conversation on medical marijuana. This was hardly a wake-and-bake kind of crowd, but they were all there to talk about weed. The event, called “Medical Marijuana: Is New York Doing It Right?” was put on by the news site Capital New York and sponsored by Citiva Medical, a company that, at the time, was vying for one of the state’s five medical marijuana growing licenses. 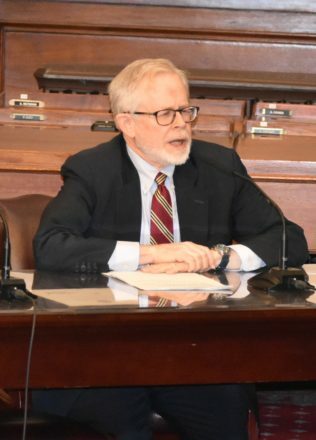 Among the stately baby boomers who would be taking part in the morning’s main event — a journalist-moderated panel discussion — was a Manhattan assemblyman named Richard Gottfried. 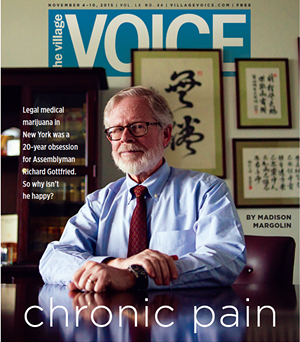 A bookish policy wonk, he had been the loudest critic of the recently passed Compassionate Care Act, which had legalized medical marijuana — but with a host of draconian restrictions that he believed had rendered the law almost useless. No, he insisted, New York was not doing medical marijuana right. Not after Governor Andrew Cuomo essentially gutted the law that Gottfried had written, perfected, and championed over the course of the past two decades. New York state and city elected officials are responding to the activism of the newly-created Community & Residents Protection Working Group (CRP), which this year has been alerting Chelsea residents to widespread building fraud that has previously gone unnoticed. At meetings with representatives of city agencies and Community Board 4 (CB4), the CRP began to flush out owners, landlords and developers who received NYC Department of Buildings (DOB) permits for construction by routinely lying on their DOB Form PW1, section 26 applications, stating that occupied buildings were unoccupied — a statement which freed them from instituting required Tenant Protection Plans, and making conditions unlivable in order to pressure occupants to leave. The CRP revealed that 80 occupied buildings in Chelsea were construction sites permitted through falsified applications. Seeing legal permits posted, residents of those buildings did not think they had any recourse. As research deepened, it also became apparent that this fraudulent situation is a citywide concern. The CRP’s findings ignited a call for action, which shows strong signs of being heard — especially by the DOB, which is receiving word from community leaders, and has its own reforms in the works. Although no specific corrective measures are in place, the drive for change has begun. 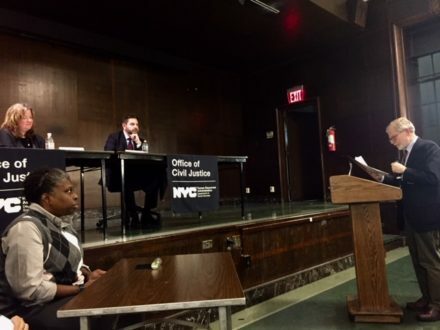 BY ZACH WILLIAMS | New York City Housing Authority (NYCHA) residents said they expect better communication and transparency in the months ahead from authority officials, as they continue to develop strategies to deal with the financial problems of public housing citywide. About 100 people attended a town hall meeting held at Baruch College (Lexington Ave. & E. 25th St.), where NYCHA tenants asked questions of officials for about two hours on the night of July 14. A similar town hall was held on July 8 at Hunter College in East Harlem. Both events followed the unveiling of “NextGeneration NYCHA,” a plan to move the authority from the brink of fiscal catastrophe to a $230 million budgetary surplus over the next decade. Vital to the plan’s success, officials said, was the participation of residents in the process moving forward, including upcoming focus groups. Hundreds of union workers marched across the High Line alongside non-union workers, elected officials and local advocates on April 10 to call for better wages for the non-union employees of numerous luxury residential buildings in West Chelsea. Non-union doormen, porters and concierges at ultra-wealthy residences around the High Line make substantially less than their unionized counterparts, and many don’t even get health insurance. “I work 40 hours a week, sometimes more, but I still can’t afford to live on my own,” said Manuel Matos, 25, who makes $12 per hour with no benefits as a concierge at 540 West 28th Street, which is owned and operated by the Ekstein Development company. The Save 16th Street Coalition, community members, and elected officials rallied to protest the construction of a mid-block 11-story luxury building on West 16th Street that will engulf the historic French Evangelical Church, built in 1835. Einhorn Development Group bought the lot for $4 million from the church and originally told the community the plan was to build a six-story building, equivalent in height to the rest of the historic block that promised to preserve the architectural integrity of the church and the charming tree-lined street. Save Union Square Park Pavilion! On Saturday, March 9, advocates, elected officials, and the community rallied in support of the historic Women & Children’s Pavilion in Union Square Park. Together we called on Mayor Bill de Blasio to cancel a Bloomberg-era contract to build a high-end restaurant in the park that would drastically reduce public access to the pavilion area. Advocates, local elected officials and community residents came together to ask Mayor Bill de Blasio to cancel the Bloomberg-era contract to build a controversial high-end bar/restaurant in the historic Woman’s & Children’s Pavilion in Union Square Park, repeating the request made Friday in a letter to the Mayor by seven elected officials. The Hopper Gibbons House (339 West 29th St.), where slaves were once given shelter, famous abolitionists met, and the Emancipation Proclamation was celebrated, is imperiled by the developer’s attempt to retain an illegally built 5th story addition. In advance of the Board of Standards and Appeals hearing on this issue (scheduled for Feb. 12th), those working to save the historic features of this landmarked 4-story row house held a press conference Sunday to demand that this addition be removed. “This disfiguring illegal 5th story addition obscures the dramatic events that transpired at this house during the Draft Riots. Because most of the addition was completed after it was landmarked and because the building permit and waiver to expand the building were invalid, this addition must come down,” said Fern Luskin, a professor of art and architectural history at LaGuardia Community College. “For years, the community has worked to save this historic building,” said Assembly Member Richard N. Gottfried. “The fate of this building is in the BSA’s hands. It must enforce the order for the owner of 339 West 29th Street to remove the illegal addition, and restore the integrity of the Hopper Gibbons House,” added Mr. Gottfried.